Marcus Collins from the Department of Politics History and International Relations won one of seven Teaching Innovation Awards this year. 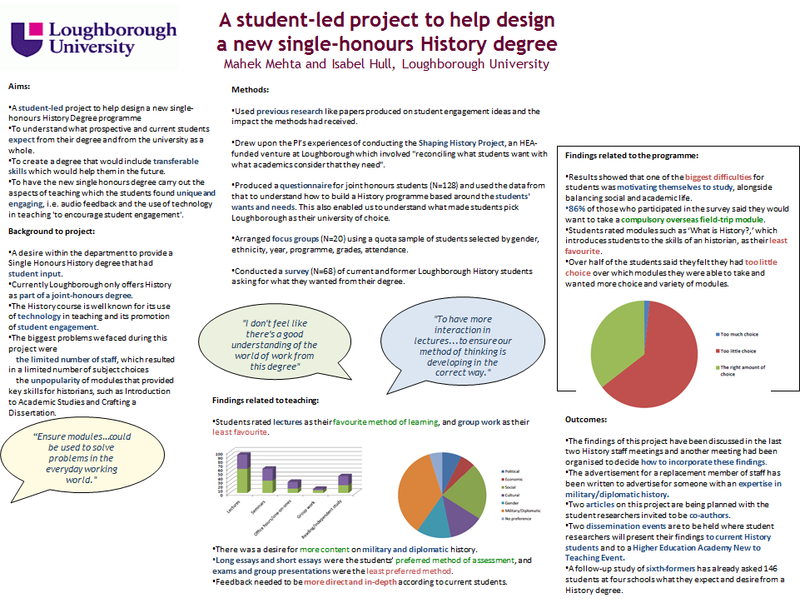 The project title was ‘Student Engagement in Curriculum Design’ and involved a group of 7 students (plus himself) carrying out research and work on the creation of a new single-honours History course set to run from September 2014 here at Loughborough. To begin with they met a number of people to help formulate and strengthen their ideas. Including a meeting with the Vice Chancellor Professor Robert Allison to talk about some of the strengths already evident in the History Joint-honours course such as the innovative learning technologies. The team also hosted a talk given by Grace Barker from the University of Newcastle, known for her work on Student Engagement. In addition to this, once the project was in full swing, the students took their work to present at this year’s RAISE conference held at Nottingham Trent University. The project’s research was focused on asking the current History joint-honours students for their feedback to find out what currently works best, and what perhaps could be changed. Research methods included surveys, questionnaires and focus groups. Other than paper copies of surveys being handed out in class some of the questions were put onto lecture slides and asked for a vote via the Turning Point clickers which added variety and captured large numbers of respondents. Results from the project showed that the current History joint-honours students enjoy the use of innovative technology; examples listed were the recorded lectures via ReVIEW, the Turning Point Clickers and also the use of Twitter for asking questions and making points during the lectures. When asked about the History lecturers and what they liked about the methods and styles of teaching, students used words such as ‘enthusiastic’, ‘approachable’ and that the students ‘are more of a name than a number’. Findings also showed that students prefer flexible assessment methods, for example, being able to choose essay questions, sources and a dissertation topic. They said that they found a greater enjoyment of the module through choice. 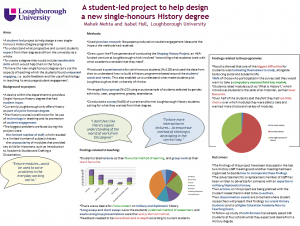 The project has developed 12 draft recommendations for the new single-honours History course. These recommendations were opened up for discussion at the History Forum on the 14th October where students and staff were invited to hear about the findings and to add their thoughts on the recommendations. a compulsory Careers and Employability module. These recommendations are yet to be set in stone but the amount of research and valuable data included in this project really has come from the student voice. The team have done a great job in capturing this and have been immersed in the design of this single-honours course which in practise will produce a student centred and excellent degree programme. The Peer Support at Lboro: Enhancing the Student Experience event, which is being jointly hosted by the Mathematics Education Centre and the Teaching Centre, will be held in James France (Room CC.1.11) from 1:30pm to 4:30pm on Wednesday, 24 April 2013. Colleagues will be encouraged to network with others from across campus, to reflect upon current practice, and to consider how future initiatives in this area might best be supported. The Mathematics Education Centre and the Teaching Centre have teamed up to host a practice sharing event entitled Peer Support at Lboro: Enhancing the Student Experience in James France (Room CC.1.11) from 1:30pm to 4:30pm on Wednesday, 24 April 2013.
to provide mechanisms for connecting people, sharing experiences and developing effective practice so that objectives 1) to 3) are met. More details regarding the practice sharing event will become available in due course. Research-informed teaching goes to the heart of the undergraduate and postgraduate curriculum. It is epitomised by the dissertations and/or projects which students themselves undertake towards the end of their studies, when staff deliver final year undergraduate modules within their field of research, and when students collaborate with staff in research and/or are exposed to their latest publications. If you have not done so already, why not have a look on the Loughborough University Institutional Repository and add some of your own items, particularly if you are already using your published research in your teaching. Ad-lib (the University Library blog) recently published The Top Five Institutional Repository Downloads from December, and continues to encourage colleagues to add items to this database, an increasingly accessed and utilised resource which recently saw the 10,000th item added to Loughborough University’s Institutional Repository! What abilities do we want our students to be able to take away with them on graduation? Knowledge and expertise of their discipline area is one, but there is also a growing emphasis on the skills and attributes that will prepare them for work and life. In the UK, David Willetts, the Minister for Universities and Science, has emphasised the need for graduates to have the right ‘technical’ skills to help them in employment. These sentiments are common to many governments across the globe, and there is now a growing body of research looking at graduate attributes and how they are taught and assessed. They found that 73% of academic staff surveyed believed the above attributes were important, but they also identified difficulties of integrating them into the curriculum. Strong beliefs and/or greater familiarity with graduate attributes amongst the academics in their sample did not necessarily translate into the successful teaching and assessment of these attributes on the ground. Harpe and David argue that the route to success lies in policies and strategies that encourage a systemic whole-of-university approach, including going beyond what the formal curriculum can offer. Relying solely on individual academics and their ability to integrate attributes into the formal curriculum will not necessarily deliver university graduates equipped for the rapidly changing world of work. It’s the annual JISC online conference this week and I’ve just been watching today (via Blackboard Collaborate) a striking presentation by Mark Stubbs who’s the Head of Learning and Research Technology at Manchester Metropolitan University. In this talk he described how MMU have been going through a complete UG curriculum re-write process in just 3 years – a task which seems even more ambitious when you hear that it has coincided with moving all online support from Blackboard to Moodle, and developing a range of other new systems and processes around, for instance, new programme / module approval. Mark admitted that, as you would expect, there had been many issues and obstacles along the way, and that the goodwill of academic colleagues was a resource that needed nurturing, but overall the change programme had been a big success. In looking to support a variety of peer support initiatives which have been taking place across campus in recent years, the Teaching Centre is in the process of creating a new online resource to support staff and students. Called a Peer Support Directory, it promotes the idea that students are particularly well positioned to support other students, while themselves gaining invaluable experience which can contribute towards their employability. A beta version of this resource is currently available at http://www.lboro.ac.uk/service/teachingcentre/info/Lee_dev/psd.html and will soon become available on the Teaching Centre’s revamped website. It will work in conjunction with a Peer Support Community of Practice which recently met for the first time, as well as a dedicated intranet site. Feedback is very welcome regarding these peer support initiatives, and should be addressed to Maurice FitzGerald (Quality Enhancement Officer) or Lee Barnett (E-learning Officer).